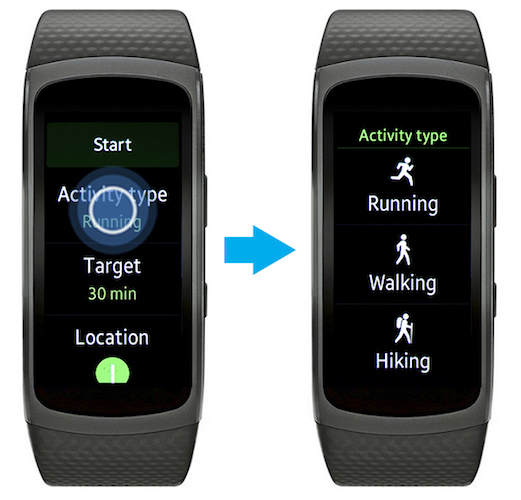 Gear Fit2: How do I Track my Exercise with my Gear Fit2 (SM-R360)? Your Gear Fit2 can monitor and record your activities during the day and encourage you to stay healthy. This app display the activity recorded in the last 24 hours. 1. 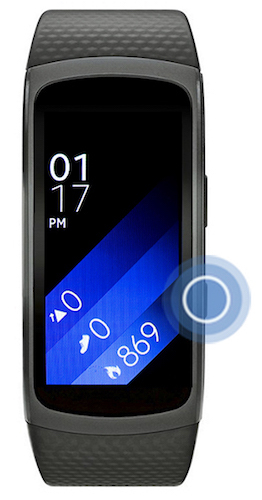 Press the Home button on your Gear Fit2. Record your specific exercise information and calories burned using the Exercise Tracker. 2. Scroll down and touch Exercise. 3. Touch Activity type and and select the type of activity you want to track. 4. Set the rest of the details, then touch Start. 5. Choose your location feature preference. If you want the Gear Fit2 to track your location, touch the check mark.